The San Diego game is the annual Salute to the Military game. San Francisco 49ers quarterback Colin Kaepernick is set to play Thursday night in military-friendly San Diego against the Chargers. Normally, that wouldn't make big news, except for the fact that Kaepernick last week refused to stand for the national anthem causing a firestorm of controversy. And what makes Thursday's 7 p.m. game even more potentially interesting is that the game has long been designated as the team's 28th annual "Salute to the Military" game. The idea behind the salute is to pay "tribute to the hundreds of thousands of current and retired military personnel who live and work in San Diego," the Chargers said in a news release this week. Kaepernick has been in the spotlight since Friday. 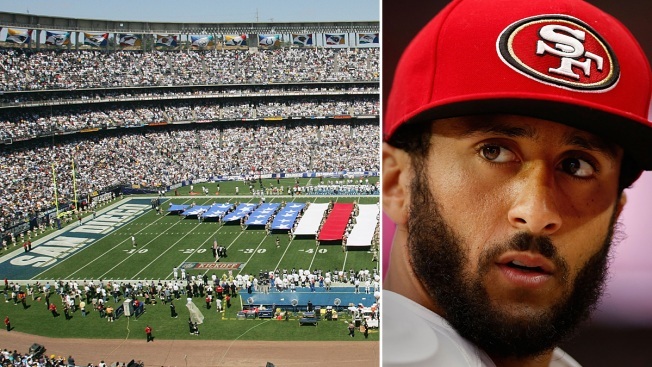 That's when he was discovered sitting on the bench during the anthem played at the 49ers pre-season game against the Green Bay Packers at Levi's Stadium, and first told to NFL Media: "I don't to stand up to show pride in a flag for a country that oppresses black people and people of color. To me, this is bigger than football, and it would be selfish on my part to look the other way. There are bodies in the street, and people getting paid leave and getting away with murder." He's also now drawing attention for wearing socks at August practicesthat show police officers as pigs. In San Diego, the national anthem will be performed by Petty Officer 1st Class Steven Powell from the U.S. Navy while 240 sailors, Marines and soldiers present a U.S. Super Flag and service emblems. Color guards from the Navy, Marine Corps and Army will present the flag, the Chargers said. Kaepernick has vowed he will sit in the bench during the anthem until people of color are no longer treated unfairly in this country. Military servicemembers and fans in San Diego are having mixed responses to the football player. Some said they do not appreciate Kaep's stance, or rather, lack of stance during the country's song. "He should be standing up because he wouldn't have those rights in the first place," said 49ers fan Mike Lemons. He added: "He has the freedom because the country has protected him." But Marine Corps veteran Isaiah Parsley told NBC 7 San Diego that Kaepernick has the right to take a stand. "You have the right to express yourself. We shouldn't use our rights to supress the rights of his freedom of expression. However he chooses to do it is on him," Parsley said. The Chargers have several players with ties to the military, including fullback Chris Swain, who attended Naval Academy Prep, and defensive end Corey Liuget's sisters, who both serve in the Army. But just because someone is a soldier or a Marine, doesn't mean they don't stand behind what Kaepernick's symbolic actions. Or at least, agree with his right to do speak his mind, or sit down during a song. This week, scores of veterans came out by tweeting #VeteransforKaepernick, saying that they are behind the player's right to express himself. And in a phone interview Thursday afternoon from the Marine Corps Airstation in Miramar, Capt. Kurt Stahl of the 3rd Marine Aircraft said Kaepernicks' behavior won't bother him. "We respect his rights as an American citizen and our organization exists to defend those rights," Stahl said. "We feel the national anthem is important to us. But we respect other views because that's what America is about."
. @Kaepernick7 if you don't like it here,then leave!I'm sure there's plenty countries that'd afford you the same freedoms and opportunities.
.@Kaepernick7 stand up, put your hand over your heart, and respect those who've sacrificed so much so you can exist.